Jute is one of the natural fibres composed of cellulose and lignin. 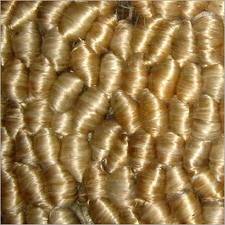 It stands among the best fibres that include the name kenaf, industrial hemp, ramie, flax (linen), etc. Raw jute is the industrial term for jute fibre. They are available in different colors ranging from off-white to brown. Their size varies from 1 to 4 metres (3â€“12 feet). Raw jute is firstly used to make different types of raw jute material which is then used to make various kinds of proucts. In Making Bags and Packaging Materials: Raw jute is widely used in the production of bags, sacks and other packaging materials to ship varied goods such as coffee beans, sugar, salt, etc. Ideal to resist condensation and spoilage of the contents, it is a quality solution of storing goods. Its high durability makes it able to withstand rough handling during transit. In Making Apparel: It has become a major raw material to design modern apparel due to its coarse texture. Ghillie suits for 3D camouflage are designed using raw jute as it is quite durable with naturally non-shiny refraction texture. In Agriculture: To wrap the exposed roots of shrubs as well as trees when transplanting that lead to control erosion, raw jute is perfect. In Making Handicrafts and Artifacts: Raw Jute is a used by artists as canvas as a stretched painting surface. It is also used to design highly attractive jewelry, and other fashion accessories. In Textile: In textile industry, it is used to design yarns, fabric, etc. that further used to produce a number of products like wrist bands, home furnishing items like carpet, rugs, photo frames, chandeliers, and so on. In Beekeeping: It is often used in hive-tending as smoker fuel as it is easy to ignite and produce generous smoke content. In Construction: Raw jute finds application in protecting rapid moisture loss in the cement as well as concrete setting by the construction industry. Bags or sacks, designed by it, are used to fill sand and flood mitigation. There are many manufacturers, suppliers and exporters of high grade quality raw jute which can be used to make different types of jute products and handicrafts. Feel free to contact us to buy or for more information on raw jute.